Ben Trube, author and one-time CMT background audience member, has admitted himself into the Helge von Koch Fractal Addiction treatment center earlier this week, following an incident that nearly resulted in the destruction of his home. “I’m doing this for my family,” Trube said in a short statement. 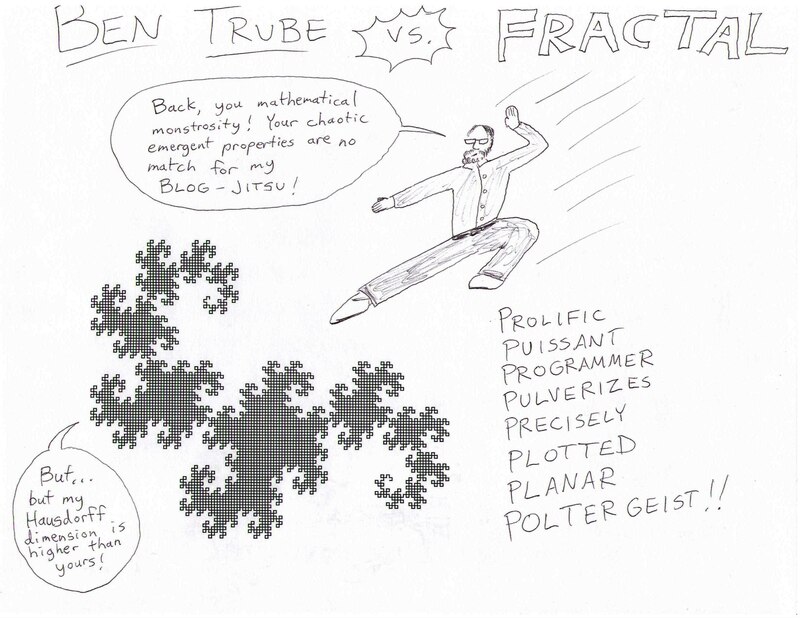 According to reports, Trube had been working on a new technique for visualizing the Mandelbrot set when his laptop caught fire, destroying many treasured chotskies including a Pikachu made of Legos and a Snoopy stuffed animal. “I’ve learned a lot about loss since that fire,” Trube added. Trube’s addiction reportedly began sometime in late elementary school, with occasional math outbursts in his mid-teens. Soon the Trube home was buried in books by Saupe, Wolfram, and Devaney. In the months that followed, Trube reportedly sank dozens of dollars into any penny book he could find on Amazon. “He’d light up when he found one with a floppy [disk] in the back,” Trube’s wife reported. Sales of the new fractal book allegedly only served to deepen the author’s obsessive behavior. “It became all he’d talk about at night. I’d be trying to go to bed, and all he’d want to talk about is L-Systems or some new Indian Kolam he’d discovered,” Mrs. Trube lamented. An unnamed source within the Koch center reported that treatment has not been going well. Promotional Poster for non-existent fractal MMA match. Nationwide, fractal addiction is the leading cause of death among mathematicians aged 80-100.